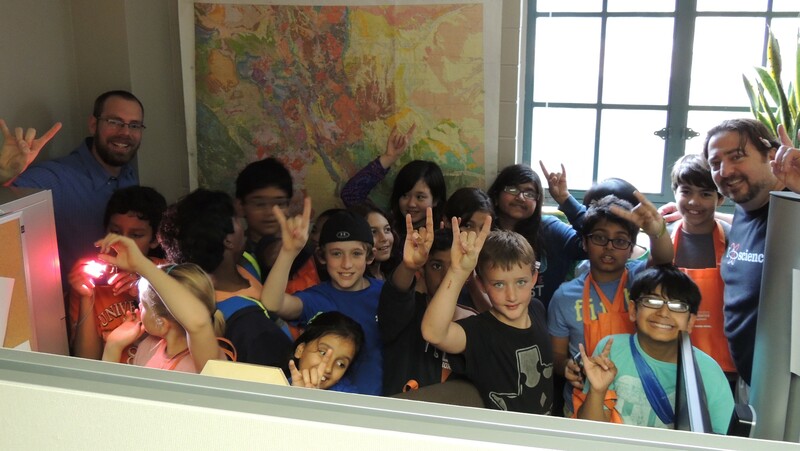 Trevor Hance (5th grade teacher, Laurel Mountain Elementary) and Kevin Befus (recent PhD Graduate from UT-Austin’s Jackson School of Geosciences) with students in Kevin’s grad student office. Scientist in Residence Teacher-Fellow partners, Trevor Hance and Kevin Befus, published an article in the National Science Teachers Association journal this month entitled “Speleothems and Sandcastles“. This article is based on a lesson plan they developed for Trevor’s 5th grade classroom. This SciRes pair from 2013-2014 engaged students in the sciences through outdoor learning and hands-on experiments during the first year of the program post-NSF funding. Learn more about the Scientist in Residence Program here!